We offer Affordable Cinematic Wedding Packages and Custom Full Day Packages that are designed to suit your personal style and wedding videography budget. We believe it’s our cinematic vision that helps us capture every beautiful moment, and the very essence of your special day. Our professional wedding videography services will provide wonderful memories for yourself, family and friends. You can count on our unobtrusive documentary style filming and movielike editing. We will ensure all the fun and intimate moments of your wedding day will be preserved forever on HD DVD or Blu-ray disc. * Full Day Coverage: We begin filming the brides preparation, usually at the mothers home. We then film the entire ceremony including your arrival and departure. The cocktail hour and reception will have a combined filming time of 4 hours. Call us for ceremonies over 75 minutes. Changes to this Statement: 1ST Wedding Video Productions. will occasionally update this Statement of Legal to reflect company and customer feedback. 1ST Wedding Video Productions. encourages you to periodically review this Statement to be informed of how 1ST Wedding Video Productions. is protecting your information. 1ST Wedding Video Productions. welcomes your comments regarding this Statement of Legal . If you believe that 1ST Wedding Video Productions. has not adhered to this Statement, please contact Paul Meyers at 1ST Wedding Video Productions. We will use very reasonable efforts to promptly determine and remedy any issues. Let's Get Started On Your Wedding Video! AGREEMENT: A firm and binding agreement exists between 1st Wedding Video (Azure IX Media, Inc) and the client only after this agreement has been properly executed and the retainer and the remaining balance has to be paid at least two (2) weeks prior to the event. The retainer is made to secure the date for the studio’s services. The retainer is the client’s guarantee that the studio will not book someone else in client’s time slot. The retainer is NON-Refundable. Should the client fail to pay the remaining balance at least two (2) weeks prior to client’s event date, the client’s retainer will be forfeited and the studio will be under no further obligation to client. This agreement is for the exact date and time. If the date is changed, and the studio is not available or the event is canceled, the studio will refund client’s money less the retainer. This agreement supersedes and replaces any previous document, correspondence, conversation or other written and/or oral understanding. Any controversy or claim arising out of or relating to this agreement, or breach thereof, shall be settled by arbitration and judgment upon the award by the arbitrator(s) may be entered in any court having jurisdiction thereof. The parties wave a trial by a jury, to the extent permitted by law, and expressly agree to mediation in any action, proceedings or counter claim brought by either party against the other, or any matter what so ever arising out of, or in any way connected with this agreement. DISPLAY RIGHTS: All digital tape masters shall remain the property of the studio. It is understood that the studio has the exclusive right to reproduce and use all footage, images, voices and likenesses for public display, advertising and/or exhibition. All digital tapes produced, videotaped, created and/or edited by the studio are fully protected by Federal Copyright Law. It is understood and agreed that the client cannot copy or have copies made of the videotape and/or DVD-R. Any attempt to do so is a violation of this agreement and of Federal Copyright Laws. The client is granted a license to use the videotape only for private home uses. Any other permission for the client to use the videotape and/or its images must be granted in writing by the studio. Client agrees to provide general notice to all guests and service providers that the event will be videotaped. With this notice, and by virtue of their attendance, all guests and service providers acknowledge and give permission for the use of their images, voices and likenesses by the studio. PRODUCTION & EDITORIAL CONTROL: It is understood that the studio is the exclusive official videographer retained by the client to cover this event. The studio is granted full editorial, production and content control by the client regarding all aspects of the production and post-production services. In the case a particular segment of the event is either not recorded, partially recorded, or not a part of the edited master tape, it is at the sole discretion of the studio as the exclusive producer of the event’s video recording. The studio cannot guarantee video or audio quality due to restrictions imposed at and/or by the event location. We are not responsible for shots that are missed or omitted because of videographer being blocked. 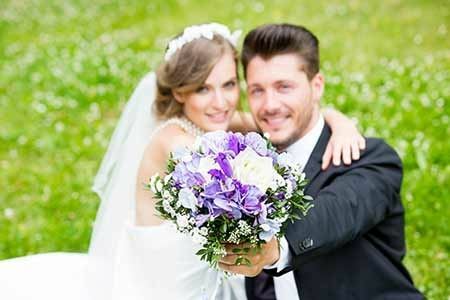 This package is our most complete offering of what most brides want included in their wedding video. Our Bride's Preparation Vignette is all about you and the time you've devoted to being the most beautiful bride. The Shoes... The Dress... The last intimate moments with your parents and bridesmaids... What are you waiting for... take the next step! Thank you for our wedding video! We now have excellent footage of our wedding and caught very personable memories!! Thank you again. We love it!!! The videographers gave us a video that we love to watch every year on our anniversary. They captured all the right moments and we barely realized they were there! We love the songs they used in our video and the expertise of every shot. Thank you for a fantastic wedding video we will treasure forever!